T.J. Clark reviews Goya: The Portraits at the National Gallery, London, on view through January 10, 2016. 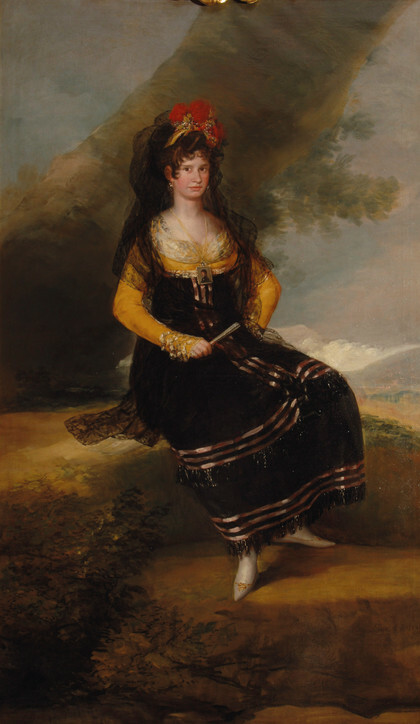 Discussing Goya's The Countess of Fernán Núñez, Clark writes that "never has a painting worked so hard to de-realise the setting and stance of its sitter ... and yet never has the resultant dream world appeared so much the condition of a terrible intimacy... Of course the setting is a fable. The great tree trunk glowering and growling over the ground at left like a gathering storm; the cottonwool glacier of cloud to the right; the pointing toe on the edge of the precipice; the Jezebel halo of red and black against the tree; the level after level of rock and scorched grass going down to darkness; and the stiff cantilevered arms: everything here is absurd and momentary and touching, a tableau, a stage set, a false confession. And the falsity is its truth. It is what convinces the viewer (and doubtless this too is an effect) that the picture was born from deep collusion, from a true mutual acknowledgment of distance – immense, unbridgeable, guarded by rampart after rampart – but also sympathy."